Can you believe it’s been over a month since I posted a brownie recipe? I apologize. 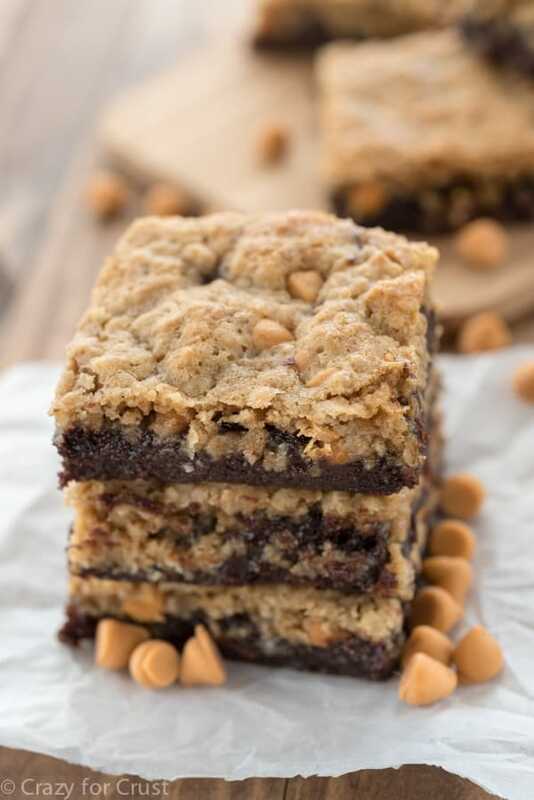 Maybe I can make it up to you with these Oatmeal Scotchie Brookies: brownies topped with oatmeal scotchie cookies? Okay before I tell you how I ate 3 trillionty of these brownies, let’s talk about Grey’s Anatomy. Pretty much by 11am on Friday I knew what happened. I’m kind of glad too, because now I have to decide if I actually want to torture myself by watching the episode, or if I should just make a clean break. Part of me wants closure. The part of me that hates the ugly cry wants to pretend the series already ended on a happy note and never watch it again. I still don’t know what I’m going to do. Grey’s Anatomy is going to keep taping since I haven’t deleted the series – yet. But I don’t think I’m going to watch it again. And if Shonda Rhimes does something like this on Scandal I might just….I don’t know. Eat a whole pan of brookies? Because I know if I do watch The Episode I’ll need some comfort food. And for me comfort food = brownies. Gooey, fudgy, chocolate brownies. 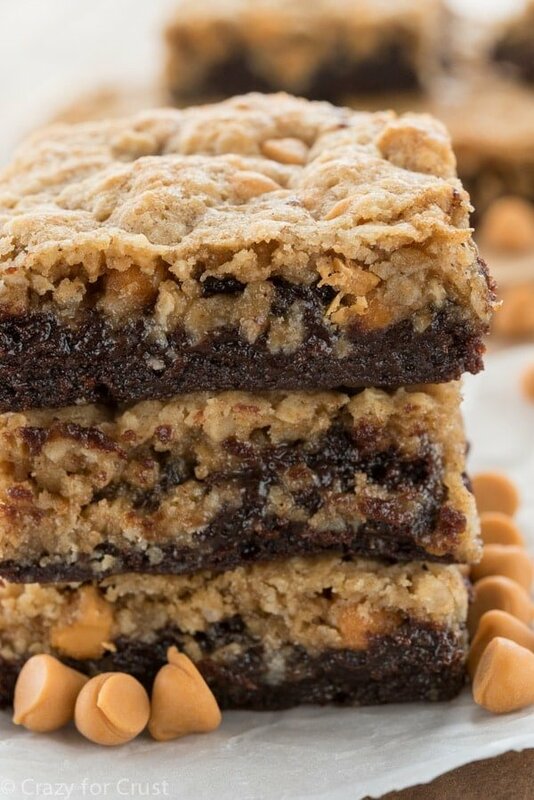 Since I often have a hard time choosing between cookies and brownies, I like to make a dessert mash-up of them: brookies! After I made these brookies I’ve been dreaming about other combinations. Then the other day I was craving butterscotch. This brookie recipe may look hard because there are lots of ingredients, but they’re easy. First, you can start with a box brownie mix. That’s totally fine, easy, and I love box mixes. If you happen to have some Homemade Brownie Mix in the pantry, you can use that too. I give directions for both. The cookie mix comes together fast. 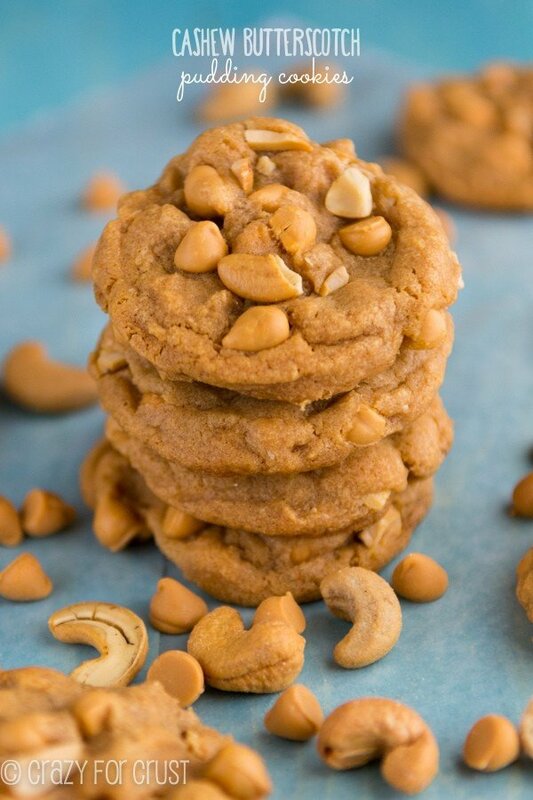 It’s your basic oatmeal cookie that you throw some butterscotch chips into. And if you don’t like butterscotch you can use chocolate chips or cinnamon chips or skip them all together! 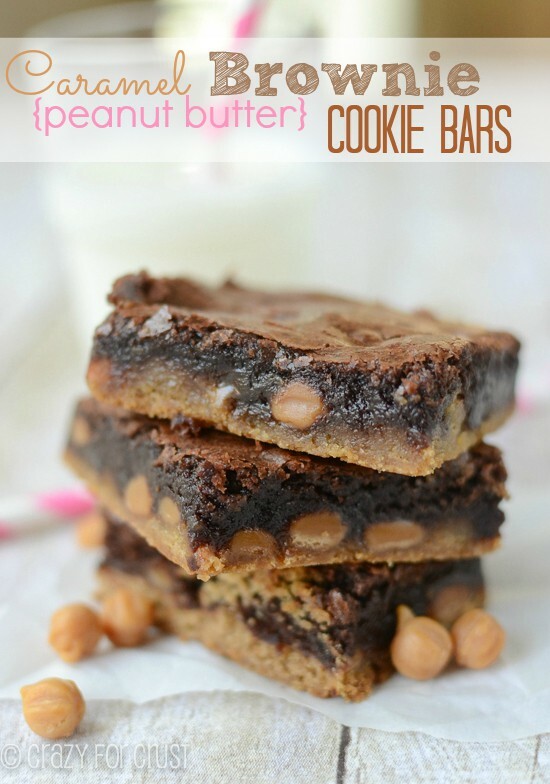 You scoop balls of cookie dough on top the brownie batter. Drop it evenly all over and then press it down a little with your hands to sort of flatten it. 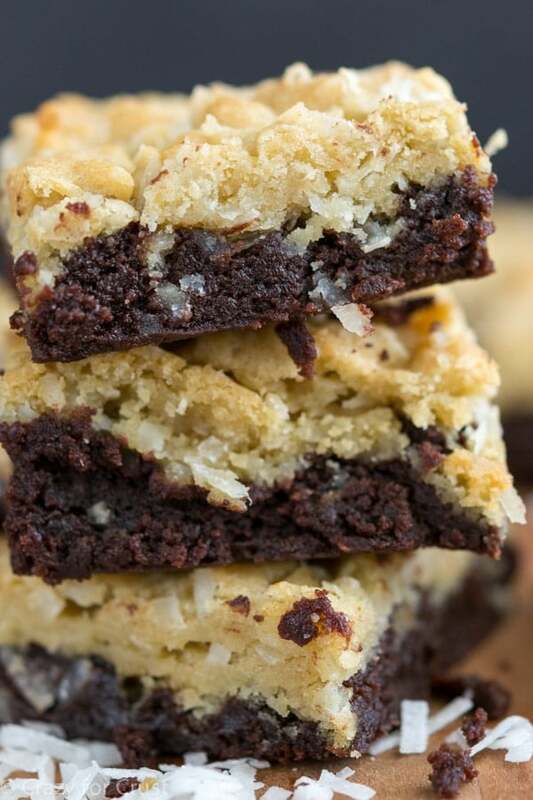 These bake up perfectly – I love a gooey fudgy brownie. After about 25-30 minutes the cookie is done and the brownie is perfect. The hardest part is waiting for them to cool so you can cut them. 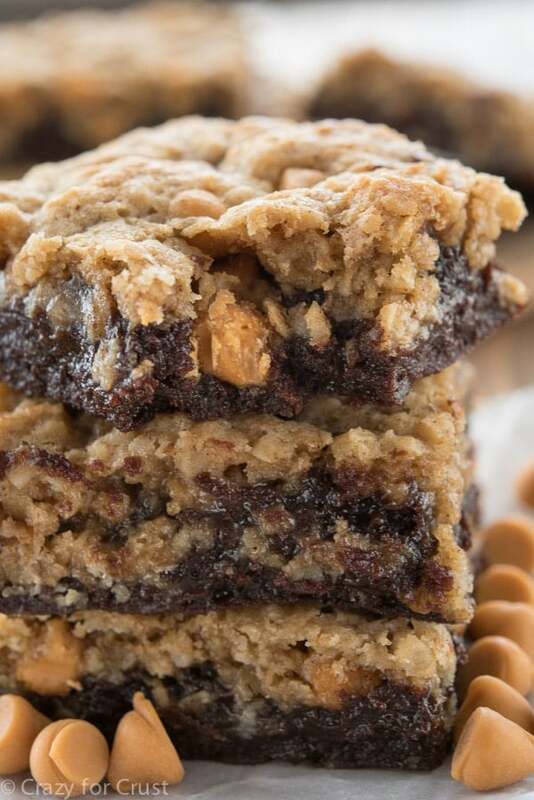 Oatmeal Scotchie Brookies - part oatmeal scotchie cookie, part brownie! Mix brownies according to box directions or stir all ingredients called for if using a homemade mix. Spread in the bottom of the prepared pan. Cream butter and both sugars until smooth in the bowl of a stand mixer fitted with the paddle attachment (you can also use a hand mixer). Beat in egg, vanilla, baking soda, and salt until smooth. Mix in flour, then stir in oats and butterscotch chips. Drop spoonfuls of the cookie mixture evenly over the top of the brownie batter. Press down lightly with your hands. (You don’t want to mix the two layers, just flatten the cookie dough a little.) The cookie dough will not completely cover the brownies but get it as close to the edges as you can. Bake for 25-30 minutes or until the cookies are golden brown. A toothpick is not a good test for these. The brownies cook but stay very fudgy! Cool completely before slicing. Store in an airtight container for up to 3 days for freeze for up to one month. Hello! I’m not sure if this has been asked before, but will the recipe be different if using rolled oats rather than quick cooking oats? If so and possible, how should the recipe be changed? The only difference is that the cookie part will be heartier. But – don’t fear – you can make your own quick oats if you only have old fashioned. Simply process them in a food processor for a few seconds until they’re slightly chopped, then measure for the recipe.